I just realized that I’ve never actually posted a blueberry recipe here before. How do I even call myself a British Columbian right? I do have a handful of blueberry recipes rolled up my sleeve, but it can be tough sometimes to actually go and feature something when you are figuratively swamped by it. Yeah, yeah, I know this sounds super bratty and ridiculous (like those people who say “sorry, I only have fifties”), but I’m not complaining at all. It’s just that I don’t even bother to do anything remotely (subjectively) worth mentioning or creative with those blues. Most of the time I just eat them like popcorn (I imagine this would be an appropriate comparison though I don’t even eat popcorn), straight out of the bowl. Thankfully, this post will fix that. And for those of you folks halfway around the world gawking at pictures of fresh blueberries (because you only have mangoes and papayas, you poor souls) you can use frozen blueberries. It doesn’t even matter if they’re small and tart, it actually means you’ll have more fresh blueberry flavour once the cake’s done. Coffee, anyone? And this is best eaten warm and crisp from the oven, so share! To make the blueberry crumble cake, preheat the oven to 350 degrees F, with the rack placed in the center of the oven. Line the bottom of a 9-inch cake pan with parchment. Make the crumble topping; mix together thoroughly all ingredients for the crumble in a small mixing bowl. Set Aside. Prepare the batter; whisk together all dry ingredients in a large mixing bowl. Puree the almond milk, coconut oil, banana, brown sugar, lemon, and vanilla in a blender until smooth. Pour the wet mixture into the dry ingredients and stir just to combine. Fold in the blueberries. Scrape the batter into the prepared pan and smooth out the top. Squeeze a handful of the crumble mixture to let it clump up, then break it coarsely over the batter. Repeat with the remaining crumble mixture. Bake for 35-40 minutes if you used fresh blueberries. If you used frozen blueberries, bake for 45-50 minutes, or until the top is browned and toothpick inserted comes out with moist crumbs. Let it rest for 10-15 minutes before slicing. 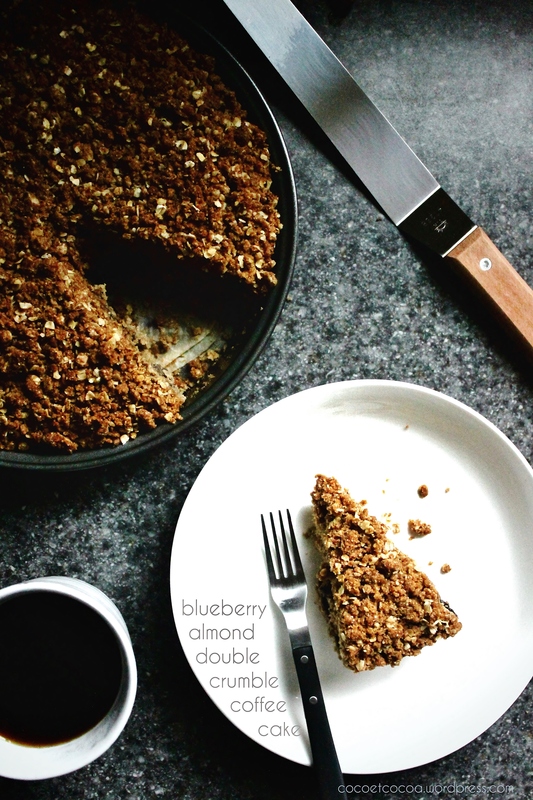 Don’t fuss over getting clean, beautiful slices (there’s double crumble, so just forget it). Enjoy with your favourite coffee!